Today is often a day when clergy seek to try to explain the Trinity. Usually we end up struggling to avoid heresy as we look for images which aid understanding. It seems to me that perhaps the most important part of the doctrine of the Trinity is that the Godhead is made up of three persons in eternal relationship. A relationship that has been broken only once, at the cross. Three persons, one God, eternally united by love. So it seems good that one of the readings set for today is the quintessential passage about the love of God explained by Jesus to Nicodemus – John 3:1-17. What would your favourite phrase about love be? What about……. ‘Love covers a multitude of sins’. ‘Love changes everything’? … Any suggestions? …………. This story, while it might make us smile, is actually quite sad – for in our society today ‘Love’ sometimes seems to be something temporary. We talk of ‘romance’; about falling in love, and falling out of love. Love is – taking her out for dinner, love is – bringing him chocolates. Love is – about red roses, and pink Valentine cards; about moonlit walks, and about good feelings. But broken relationships seem now to be almost normal, and so many of us need healing from the pain that relationships cause. Christians talk about ‘fellowship’ or ‘brotherly/sisterly love’. And when we experience that love from other Christians it is special. But even Christian love is never perfect – and we can still be demanding and self-serving. The truth is, that whether we talk of fellowship, or of romantic love – however good our relationships are – we are often left hurt and disappointed in our relationships. The depth and breadth of God’s love cannot but provoke a response. It is the Cross that provides the central focus of that love. The death of God’s Son. The place where the Godhead – Father, Son and Holy Spirit – is torn apart for love of us. The place where God takes into God’s very self all the pain and evil of our world. Our salvation, our relationship with God was secured not by an exercise of power, but by an exercise of submission. Christ first identified with our humanity and by doing so hallowed this world and all human existence and then submitted himself to destruction through human jealousy and rage. Love which suffered everything so that we might be drawn back within God=s loving arms of mercy. 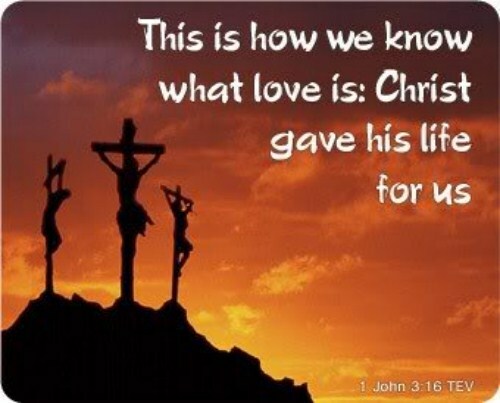 The mystery of the Cross is that there Love died so that love might live and triumph. And it is also the image of the Love that we are called to show – where we are prepared to be vulnerable rather than seeking power and control in our relationships. At the Cross, God’s self giving love is expressed more clearly than anywhere else. ‘This is love’, says the Bible, ‘not that we loved God, but that he loved us and sent his Son to die for us’. This is love that has sacrificed all for us, love that holds us fast and sure when we struggle with doubt and fear. But more than that, this is love that gently calls us to love, that encourages us to give of ourselves vulnerably to others, love which calls us to identify with the world around us, love which gently suggests that no sacrifice that we can make is too great. For the true measure of sacrificial love is not that shown by our neighbour, but that shown at the Cross. This entry was posted in Ashton-under-Lyne Blog, Comment on May 31, 2015 by rogerfarnworth. 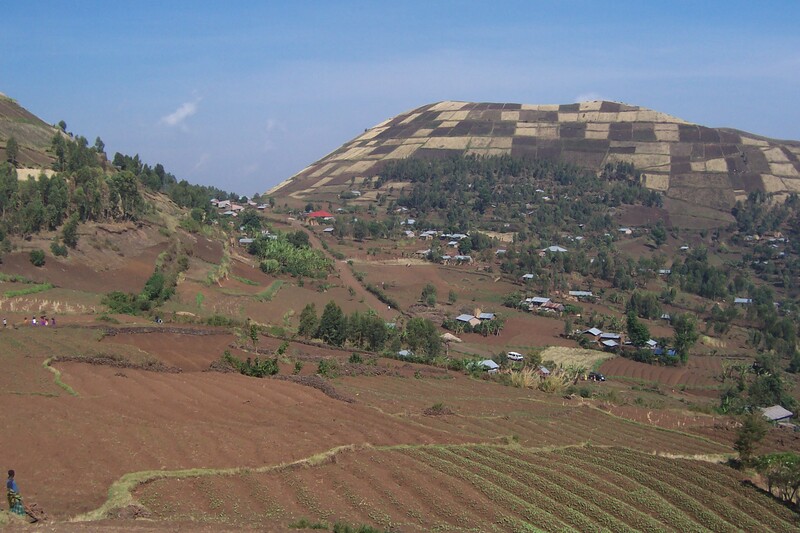 Kisoro in South West Uganda is dominated by a chain of Volcanoes – The Virunga Mountains. 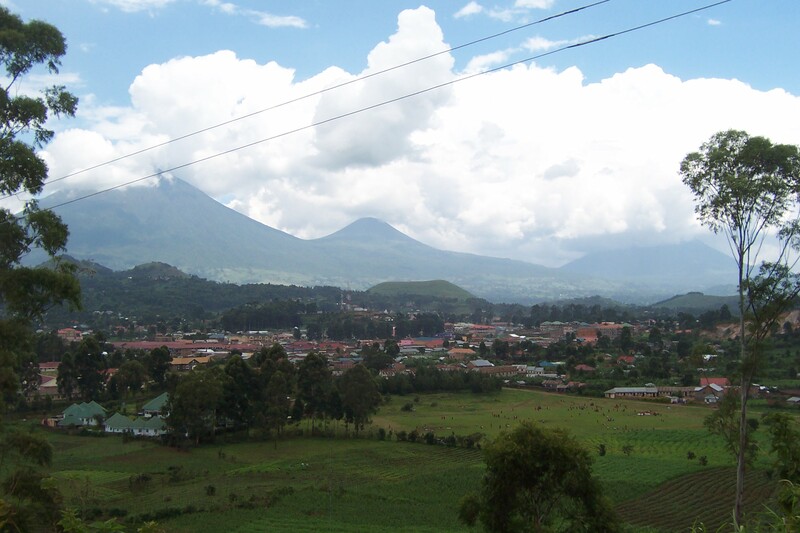 The closest is Mt Muhabura and it gives its name to the Church of Uganda Diocese that I visited in April – Muhabura Diocese. Of theses 7 volcanoes only one seems to be anything other than completely dormant. Over the millennia, what were once deep valleys have been filled with the lava flows from these volcanoes, leaving small hills of sand stone in the area which once would have been high hills. The pumice stone which fills the valleys is very porous and allows water to flow below ground. This means that in the wet season the area is lush and green but in the 3 month long dry season all the water in the area disappears underground, only to be seen at locations where springs come to the surface. 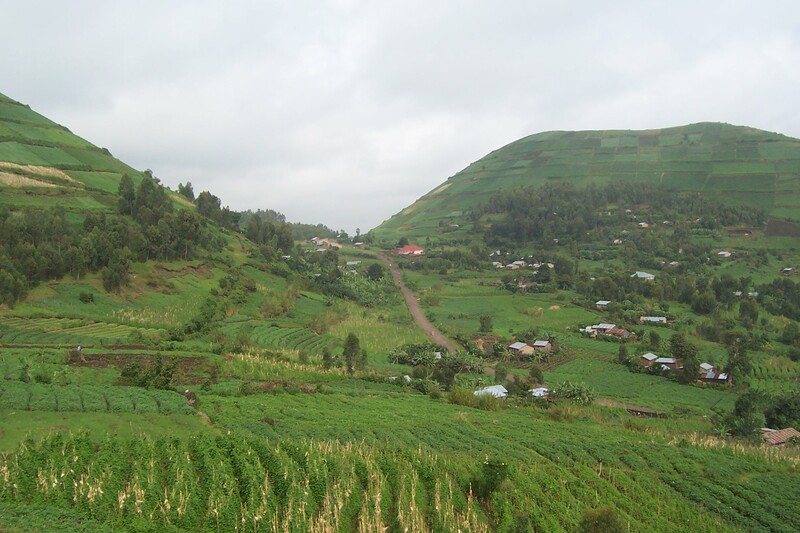 The village of Nyakimanga (pronounced Nyachimanga with a hard ‘g’) in lush and green in the wet season. but dry as a bone in the dry season. These two photos show the difference. The first was taken in April this year. The second was taken in September 2013. For three months of each year the children, usually the girls, of Nyakimanga have to set aside their education to collect water. 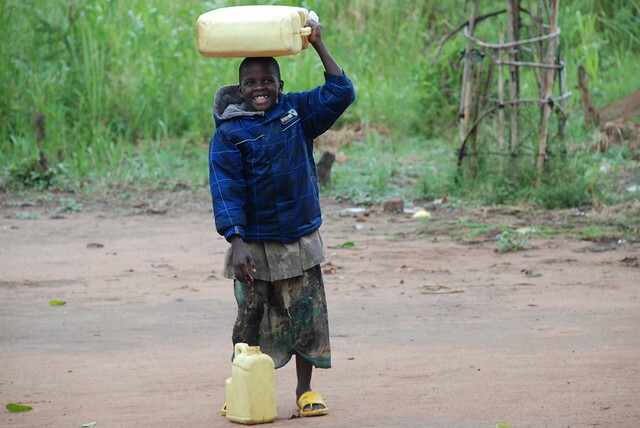 They walk around 5 km to the nearest springs and then carry back heavy jerry cans full of water. It is a hard life. I am delighted that St. Martin, Droylsden, The Good Shepherd, Ashton and a number of local Church of England schools raised enough money at Harvest 2014 to provide Nyakimanga with a water tank. The money reached the village at around Christmas time and they formed a committee led by the local church leader and they have decided together on the size and construction of the tank. They have employed local contractors and the tank has been built. When I was in Uganda in April, they had completed the reinforced floor of the tank and were well on with the constriction of the walls. Once the tank is completed it will be fed from the roof of the church and one of the local houses and it will hold enough for very basic use by villagers throughout the dry season. They are overwhelmingly grateful to people in the UK who have given so generously. This entry was posted in Uganda on May 17, 2015 by rogerfarnworth.